Spring arrived today in the form of a pink and green nursery with aqua walls! With a baby girl's nursery like this to enjoy; I can wait for the tulips and daffodils to bloom for just a tiny bit longer. In the years I've been involved in decorating nurseries; I've never come across this refreshingly different color scheme. 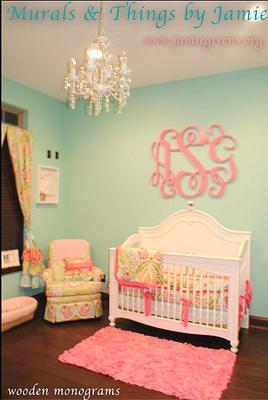 The large wooden monogram on the wall behind the crib is the focal point of the room. There are touches of pink sprinkled throughout the baby girl's nursery but one of my favorite features is the beautiful nursery wall monogram created by a very talented mural artist. Jamie's wooden monograms are not your average, run-of-the-mill 1/4 machine cut monograms. Her beautiful letters are 3/4" thick with 3/4 bumpers to space the initials off the wall to make them an eye-catching focal point. The contrast of the aqua wall color and the soft pink curves of the medallion is stunning. Of course, pink letters are lovely with many shades of green as a background as we see in this example. And as you can tell, these letters are not "small" at all; you can custom order them as large as 48" in size. I just LOVE monograms on everything especially on walls, clothes, blankets..you get the picture. I think a girl's initials should go on everything starting with her walls! I hope that visitors to Unique Baby Gear Ideas have enjoyed these sweet green and pink nursery decorating ideas and that you will consider adding a monogram made by Jamie to your list of wall decorating "must haves". I love the furniture that you bought. 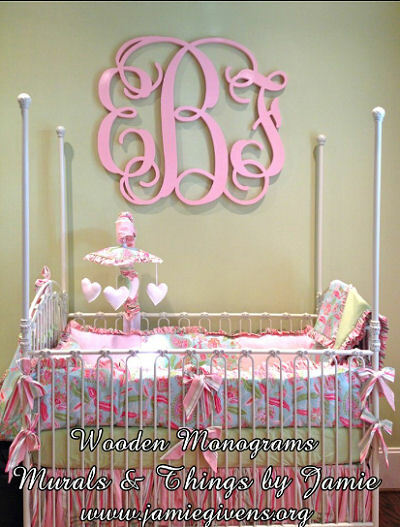 Very classy and pretty for a baby girl and the monogram is perfect. Does the lady, Jamie, still make and sell them? If so, how much are they and how long does it take before they are shipped? Hi, I have been looking everywhere for the bedding in this picture. Can you please tell me where I can find it? Thanks so much! Can you please tell me what color Aqua you used for the paint color in the first picture. Monograms can be any size, color, or finish. This room is beautiful! And the monogram just makes it!!! Can you tell me what size this particular monogram is? Thanks so much! I would love to make you a monogram! I have had lots of emails about this room. I contacted my client to get more information for you all! Bedding is by Little Charlie May (can find her on etsy and fb) Paint color is Aquaduct by Sherwin Williams. It's a little brighter in person. All of the prices for the large custom wooden monograms are listed on my website, along with all the information. Simply go to www.jamiegivens dot org and click on wooden monograms. They can be shipped anywhere. Shipping cost depends on size and shipping location. There is more information about shipping costs on the site as well. if you have any other questions, feel free to email jamie@jamiegivens dot org or call (859) 492-1091. Thanks so much for asking!! Love the monograms, what are your prices and where will it ship from?